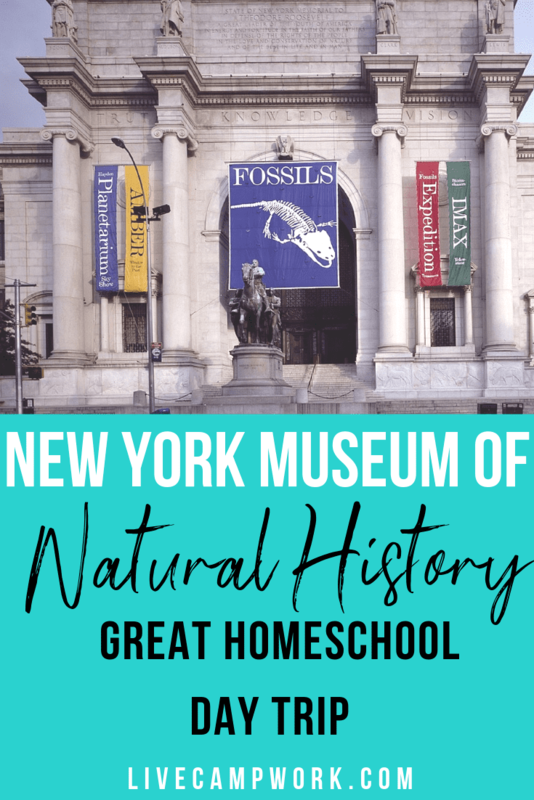 We just love the films, Night at the Museum so much, we knew that part of our trip to NYC would have to include a field trip to the American Museum of Natural History near Central Park. How can you visit New York and not have this iconic attraction on the top of your family bucket list? I don’t know, but we made it a top priority and had an amazing day! The American Museum of Natural History is almost 150 years old! It is said to encompass over 2 million square feet inside its 28 connected buildings! If you enjoy slowly browsing exhibits this is the place for you! 45 permanent exhibits are always on display and depending on when you visit, you’ll see a variety of others like Cuba and the Humpbacks that were on display during our visit! Also during our trip, they were featuring items that are usually stored in the museum basement (or maybe it was the attic), things that you pack away and forget about I guess-, but they were truly amazing so maybe they weren’t all that forgotten. My kids especially enjoyed the collection of specimens being store in jars! They had everything from snakes to baby rats, and everything else that makes your skin crawl… It was like being in a college science classroom with everything you ever wanted to examine and that crazy professor who encouraged you to do so. Such a cool experience- even though we couldn’t actually take anything apart, of course. The museum displays the natural evolution of people and animals thought the years, and is also home to an IMAX theater, and planetarium. Sitting in Theodore Roosevelt Park, just right across the street from another icon- Central Park, you can plan a full day of family fun with additional activities like a lunch picnic, trip to the zoo or just a fun stroll over to the giant Whole Foods Market, that I personally fell in love with! Elevators for your carts, beautiful pastry and fruit displays, a variety of organic produce-what’s not to love? As you may already know, we are using the Oak Meadow complete homeschooling boxed curriculum with our kids for the next year. The program is built around the encouraging kids to think and explore naturally. Having them think outside the box and deeper into he concepts they are learning about through the text. I felt that since all our children are so fascinated by rocks, minerals, fossils, and dinosaurs in particular, our time at the museum would best be focused on these finds to keep their attention, which ties into the Oak Meadow philosophy of cultivating wonder and a connection to the natural world. Oak Meadow is also about developing independent learners through child led learning, which is something we’ve been working on since last summer so we took a step back. We let them lead and to my surprise these were the exact areas that we spent the most time exploring. Go figure. The Arthur Ross Hall of Meteorites: How many times are you going to get to be up close and personal with a giant meteorite and live to tell the tale? We figured not too many, and the kids had a great time with all the educational content they offered on the how they use the meteorites to research and answer questions about our solar system. We viewed over 100 meteorites in addition to moon rocks and specimens of Mars brought back from the Apollo missions. How cool is that? Another cool aspect of the museum is the content offered on their website for educators! The provide further explanation on the exhibits to a user questions and help educators form lessons around these complex topics. Through the flexibility, which we love, of the Oak Meadow program we are free to choose spelling words related to you’re reading, field trips or whatever else you’re learning about, so its easy to use the ones suggested by the museum: Meteorites, Astrophysics, Solar system, Astrogeology, Meteors & Asteroids, and tie in the trip even if it’s not actually part of the current lesson! Morgan Memorial Hall of Gems: Precious stones, both polished and uncut, along with some jewelry are all on display in this jaw dropping exhibit that my girls went goggly eyed over! The museum actually holds over 100,000 specimens of minerals and gems, and like the ones we viewed in this hall- it’s really hard to pick a favorite. Out of all the exhibit halls we visited, this one was the most crowed! And usually that would have disqualified it from being on our list of must see & do, but because we’re talking about priceless gems, rubies, emeralds and so many more- we gave it a pass! The Gem Pocket was cool. It’s basically a recreation of a crystal filled cavity inside rock formations, like this one that was found in San Diego County. The Star of India was incredible! It’s a 563 carat, blue star sapphire which is actually the largest in the world. The Patricia Emerald was Awesome. It’s a huge twelve-sided crystal that was found in Columbia and sits at 632 carats! They also had an incredible amount of quarts! My kids love quarts- so this really hit home! Fossil Halls: Let’s just be clear, a trip tot he Natural History Museum would not be complete without a trip to the hall of fossils, or in this case 5 fossil halls located on the 4th floor! If you plan your trip right and want to view them all, you can simply start at the Orientation Center, where visitors can get an overview of the more than 600,000 specimens and watch a quick video presentations before following the black line marked on the floor to see the fossil halls. I won’t go into a bunch a details about what we saw, because quite frankly it was a ton of information, huge displays, and even interactive ones- that it would make this post way too long! I will say my two favorites were the hall of Saurischian Dinosaurs and the Hall of Advanced Mammals! These were spectacular! After a full day of walking around the museum we were so thankful we parked onsite in the basement parking garage, as the walk was really close! Being in the city always gives me anxiety, so any way we can ease that a bit with things like onsite parking, onsite cafes or picnic areas, and even a small gift shop where the kids can pick up an item they want to take home to ‘remember’ their trip by… we are likely to buy in! Our trip went smoothly and I was pleased that we are still able to tie it into our homeschooling! In a perfect world, homeschooling would flow seamlessly with the daily activities of life, this is a start and I appreciate the flexibility it provides! Understanding the Workamper Lifestyle is Key!